Bear with us...we're a bakery, not Google, and we can't control the site traffic. We built this website as a means to help customers find an alternative way to reach us, but we also experience very heavy traffic, so certain times the site may stall. We apologize in advance for any inconvenience. We do offer Cronut® pastries each morning in the bakery and welcome you to visit! Welcome to the official Cronut® Pastry Preorder system (Beta) of Dominique Ansel Bakery in New York City, the birthplace of the Cronut® pastry! This allows you to reserve and pre-purchase your Cronut® pastry. 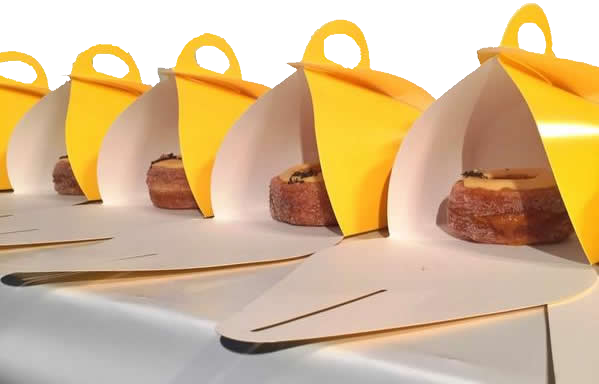 For more information on how to get the Cronut® in alternative ways , please visit us at: https://dominiqueanselny.com/frequently-asked-questions/. Please note that these pre-orders are for IN-STORE PICK UP HERE IN NYC ONLY. Every Monday at 11am EST sharp, we will open up the system for PREORDERS. The site will NOT be opened for orders before then. Guests can pre-order a minimum of 2 and a maximum of 12 Cronut® pastries per person per week. Please do not attempt to order from multiple dates below or above this maximum number as it could interfere with your order from showing up on our systems. For April 2019: the flavor is Cinnamon Roll Custard, with creamy cinnamon roll ganache and custard. For May 2019: the flavor is Summer Berry Mascarpone, with homemade berry jam and creamy mascarpone ganache. We will announce the May flavor on the last week of April. Price per Cronut® pastry: $6.00 (*price does not include sales tax. *) Note: because of the high demand and small inventory, it is easy for a day to sell out between the time you load the page and by the time you press "Buy Now". Our apologies. Please try another date. If a purchase is not completed in 10 minutes, the items in the cart are released back to the inventory. This means that new inventory may be released from those held in shopping carts even after you see a "Sold Out" sign. Please do check back. Monday, Apr 29 Sold out. Tuesday, Apr 30 Sold out. Friday, May 3 Sold out. Saturday, May 4 Sold out.